"Dedication is not enough," The Nation warned, "Eagerness is not enough, nor a warm heart." 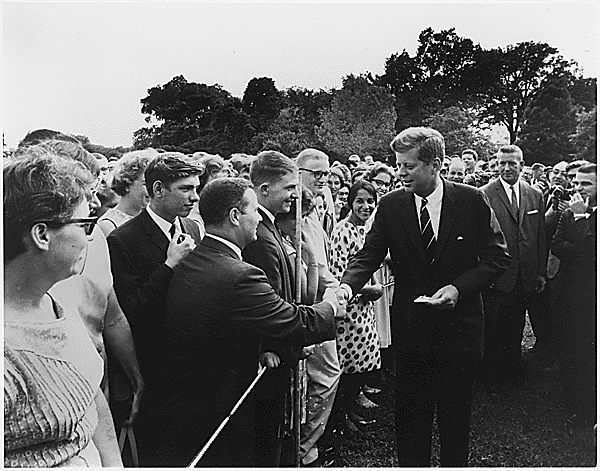 John F. Kennedy greets Peace Corps volunteers in 1961. Photo via Wikimedia Commons. On this day in 1961, the newly inaugurated president, John F. Kennedy, followed through on a campaign promise and an idea he had promoted since he was a mere congressman in the early 1950s: the establishment of a corps of young volunteers to assist American development efforts abroad, as Kennedy’s executive order put it, “in conjunction with or in support of existing economic assistance programs of the United States and of the United Nations and other international organizations.” Richard Nixon, Kennedy’s opponent in the presidential race, derided the idea of a “corps of escapism.” The Nation, in its editorial, was concerned that because the project was not military in nature it would not be treated with the urgency the task required. Dedication is not enough. Eagerness is not enough, nor a warm heart. Those chosen to serve in the Peace Corps must be able to give what is needed to the countries where they are assigned, and that requires technical competence as well as love of country and love of humanity. The situation recalls one that followed the Russian revolution. A few American revolutionaries, among them Bill Hayward and Emma Goldman, shook the dust of American capitalism from their feet and departed to the Red Utopia. There was nothing for them to do. The Russians didn’t need revolutionists; they needed engineers. If the Peace Corps needs a year before it is prepared to serve some countries, a year it will have to be. But—and here is where administrative skill comes in—there should not be a single day of unnecessary delay. In some fields, such as the teaching of English, considerable speed should be possible. The way in which this project is managed and whether the enthusiasm is sustained or dies away like a juke box hit song, will be a test of America’s qualifications for international cooperation in the sixties. The light which performance in this project will throw on the United States will be only less important than the help it may give to other countries. If a new missile were involved, and hundreds of millons of dollars in profit, the necessary urgency would automatically be generated. Here there is no profit and no opportunity for mass slaughter. It is a novel kind of challenge.